Capacitive touchscreen displays are typically more responsive to touch interactions because they do not depend upon the pressure of a touch. But because they are dependent upon conductivity, this means the must register a touch. In order for a capacitive display to register a touch, one must touch a screen using an object that has some conductive properties. Capacitive touch screens rely upon sense conductivity instead of pressure to register a touch. There is a limit to the number of objects that will register a touch. Fewer accidental interactions. Capacitive screens are typically used in harsh environments. Industrial-use displays will take a beating, but capacitive screens will usually work better than others when screens are scratched or shattered. Most capacitive touch screens use glass top layers instead of plastic flexible layers. There are different objects that can interface with capacitive screens; stylus, finger, gloved finger, etc. Plus, pinch to squeeze and multiple fingers or gestures. Capacitive touch screens are more precise. Capacitive touch screen displays do not rely on just pressure, instead they use electrodes to sense an object’s conductivity. Also capacitive touch screen monitors tend to be more vibrant than resistive touch screens because of their glass screens. There are certain industries that will really benefit from using capacitive touch technology. The best way to identify what is needed for your specific industry is to define whether or not the touch interface object is important and if higher graphics quality is also important. 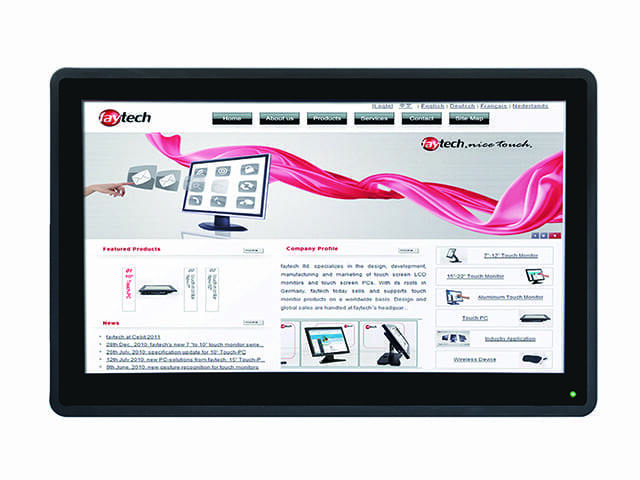 There are numerous manufacturers on touch monitor display in the USA but none that can offer the quality and service that faytech North America can. 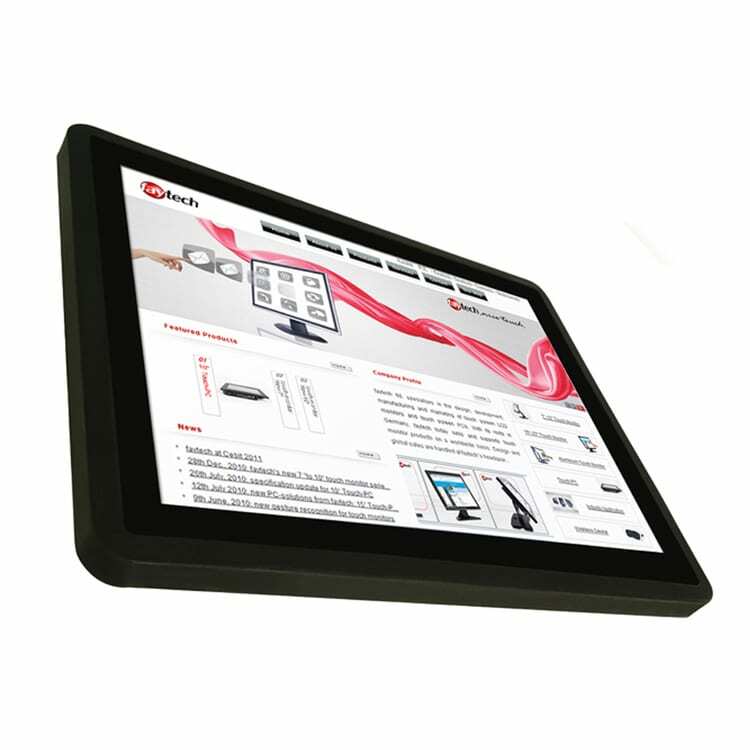 In most cases, our capacitive monitors are the best solution for a broad spectrum of commercial and industrial applications. Capacitive monitors are great additions to technical and industrial settings. These displays are intended to be used with bare human fingers, but there are stylus pens that are specialized for use with capacitive displays. In summary, there are several different capacitive screen types. Surface capacitance display screens which are coated with conductive layers on only one side. These have a limited resolution and are most often used in touch screen kiosks. Then there are Projected Capacitive Touch (PCT) displays which are most often used in point-of-sale (POS) transaction devices. These displays use etched conductive layers combined with electrode grid patterns. Next there are PCT Mutual Capacitance displays used in multitouch displays and these have a capacitor at each grid intersection with applied voltage. Lastly, there are PCT Self Capacitance display screens with columns and rows operating individually due to current meters. These are designed to function ideally with just one finger. No matter what your organizations specific needs are, faytech North America, Top 10 Touchscreen Manufacturing Company can supply you with the ideal capacitive touch screen solution. We can even develop custom models for unique use case scenarios. Contact us to learn more about our touch screen technology and to ask any questions you might have.